Healthcare in the Kemmerer/Diamondville area has come a long way. Back in 1913, the United Mineworkers' Association established a tiny medical facility at the top of Park Drive above Archie Neil Park. 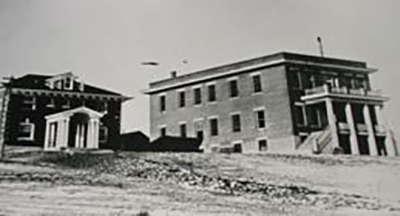 Later that year, the name became Lincoln County Miner's Hospital. This medical facility formed a solid bedrock, which operated as the primary source of medical care for not only the immediate Kemmerer, Diamondville and Frontier cities, but also for dozens of communities near and far from the surrounding area. For nearly 50 years, the miner's hospital operated as the sole care provider for people in nearly a 100-mile radius. In 1959 a decision was made to establish a taxing entity to support the hospital and the South Lincoln Hospital District was formed in 1960, and over the next 18 months construction commenced on a 20-bed hospital, dedicated in 1961. Construction on a new hospital began in 1986 and construction commenced over the next 2 years to develop what is the current space infrastructure of the 17 licensed bed acute care inpatient unit, with 2 ICU beds, and 7 Swing Beds, 3 Emergency Room Bays, as well as 2 surgical suites, advanced radiologic, and laboratory, and outpatient clinic facilities. In 1988, the new space was dedicated and South Lincoln Medical Center was formed. In 1997, after a series of hospital closures in the 1980's and early 1990's, Congress passed the Balanced Budget Act of 1997, which created the designation of Critical Access Hospitals (CAH) under the Center for Medicare and Medicaid Services, and South Lincoln Medical Center was among the first of these CMS designated facilities. In response to a growing aging population in the 1990s, in 1999 construction was completed on the addition of the 24-bed Nursing Center. South Lincoln Nursing Center is a fundamental resource for the Lincoln County community, and has celebrated nearly 20 years of certification by the state of Wyoming as a quality nursing center. The disparate locations of communities, and hospitals and sparsely populated areas of Wyoming, mean that the Emergency Medical Services (EMS) of South Lincoln Hospital District are critical to our communities. In 1999, SLHD dedicated the Emergency Medical Services Multi-Purpose Building, and has continued operating out of this space, in conjunction with satellite stations, covering more than 3,000 square miles across southern Lincoln County with both Intermediate, and Advanced level EMS services.